This is a fine slice of slightly leftfield luthiery and another class act from Fret-King. Intelligent design and build; the trapeze tailpiece and Vari-coil summon versatile, very 'semi' tones. Pre-production blips aside, very little, if a little pricey. Signature guitars can be highly polarising, idiosyncratic in specification and limited to acolytes of the artist. If we're honest, Gordon Giltrap's first Fret-King signature fell into that camp with its multi-knobbed magnetic/piezo setup that was far from everyday. But irrespective of whether you're a fan of the veteran British guitarist or not, this new version has much wider appeal. Based on the Elise platform - like Giltrap's original model and John Etheridge's signature - this downsized, offset semi employs the Elise's standard six-in-a-line back-angled headstock, which recalls Gibson's Trini Lopez models. A fairly standard trapeze tailpiece with a dark brown ebony insert also features, which, again, references guitars such as that Trini Lopez and Gibson's Barney Kessel signatures (the full production models will have a crown motif, designer Trev Wilkinson informs us). Electronics, too, have changed for a simpler magnetic-only drive. Both Alnico-loaded humbuckers have brushed satin covers: a Wilkinson WVC is at the bridge and a WDG a mini-humbucker is at the neck, the latter of which is mounted in a soapbar single coil- sized cavity. Unlike a classic Gibson four-control layout, we get Wilkinson's rotary Vari-coil, which morphs both pickups from full humbucking to single coil, plus a master volume and tone knob, and a three-way toggle pickup selector. What we like about this piece is the different characters it summons up... and the combination of that mini-humbucker and the Vari-coil provides some interesting textures. We've looked at the Elise on a few previous occasions and it remains a hugely credible platform. The two-piece mahogany back is routed out to leave sides and a centre block that stops just below the bridge. The body is sealed with a maple top that's carved inside and out and then faced with a subtly flamed maple veneer. At 368mm (14.5 inches) wide and 450mm (17.75 inches) long, it's smaller than a ES-335, and the treble-side is pulled down, offsetting both the horns and the waist. A major difference from any of the other Elise models is an overall satin finish that sort of simulates Gibson's VOS and creates an older vibe that just begs for a little burnishing, either from playing or a little mild abrasive and elbow grease. The weights of the various Elise models we've reviewed have fluctuated a little, but here, at 3.48kg (7.66lb), it's perfect. Generally, the build lives up to the cost with tidy cream binding on the top body edge, the two f-holes and the fingerboard, which is given an over-aged yellowing from the nicely applied Tobacco Sunburst on the front, back and neck. It's a set-neck design, as you'd expect, and uses a Gibson-style 629mm scale. Frets are tidily installed and well polished with a chunky but not over-big gauge on the 305mm (12-inch) cambered ebony fretboard. 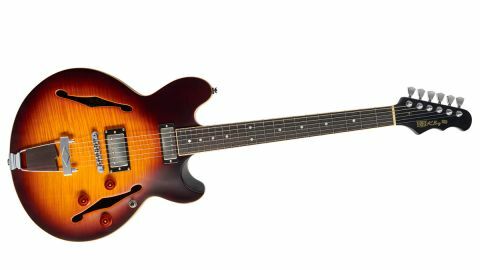 For anyone who finds an ES-335-style semi too big, this makes for a much more comfortable player, much like Gibson's ES-339, for example. With a rim depth of 45mm and a max depth of 57mm, however, it definitely has a semi bulk about it, though its flat back certainly trims that a little in playing position. Maybe it's because we're familiar with the guitar, or simply that its dimensions are so right, but it feels like an old friend. That familiar feel continues with the neck shape: a classic deep oval (21.1mm in depth at the 1st fret, 23.5mm at the 12th) that few players will have any issues with, while the nut width feels very normal, too, measured at 43.5mm with a string spread of 35mm. One pre-production issue is the narrow spaced tune-o-matic style bridge (it should be the wider 52.5mm version, says Trev Wilkinson), which means the 'F-spaced' bridge humbucker appears a little off-centre on our sample. Mind you, this doesn't audibly affect a thing. Even before we plug in, it's the trapeze tailpiece that seems to impart a fundamentally different resonance from any of the previous Elises we can remember, adding a more 'semi'-like response with a snappier, shorter sustain that's enhanced by a pretty low, buzzy supplied setup with 0.010s. Raising the action, especially on the bass side, removes most of the buzz, and we'd be more than tempted to raise the string gauge to 0.011s if we wanted to chase a jazzier voice and even consider flatwounds. But if that's less of your bag, no worries: the combination of that mini-humbucker and the Vari-coil provides some different and interesting textures. With the Vari-coil full up (full humbucking mode on both 'buckers), the mini-humbucker is a great choice with a little more focus and clarity compared with a full- size unit, albeit a little lower in volume. Knocking back the master tone and the volume reduces some of the edge for what emerges as a very clean, clear and defined low-output voice that certainly adds articulation for more complex chord voices or denser effected tones. The Vari-coil control here isn't quite as smooth in its transition from full to single coil as we've previously experienced - most of the action happens in the last quarter of the pot's travel - but, again, Trev puts that down to a pre-production blip. Even so, in full single-coil mode, with the Vari-coil fully anti-clockwise, the mini-humbucker's sound gets pretty thin, almost acoustic-y, which might be a little too much for more everyday tastes. The bridge humbucker fares better in the same Vari-coil position (which voices the screw coil on both pickups), although having the Vari-coil just on the bridge pickup only might actually help the twin-pickup position balance. What we really like about this piece, however, is the different characters it summons up. With a rockier, crunchy gained amp channel, the bridge's voice has spike and a little honk that's very ES-335-like, although the trapeze's hallmark gives it less generic bluster: less fusion-y, more rootsy. And while this guitar is pretty feedback-resistant at volume, you can coax it into musical feedback and push down on the trapeze - it would be a great platform for a Bigsby, too. John Etheridge's and John Jorgenson's Fret-King signatures are very much guitars for players who like tonal subtlety, and this new Giltrap model is no exception. It moves from almost electro-acoustic-like voices to beefier, bright PAF-alike crunch from the bridge with a clearly defined neck humbucker that removes the mud but retains the cream. There's an undeniable 'old Gibson' feel to the playability, but it has more than enough Wilkinson DNA to make it very far from just another ES-335 clone or an overly idiosyncratic signature. That trapeze certainly imparts an almost ES-330-like character, too. There's a resulting clarity that will appeal to anyone using more complex harmonies, but it's just as valid in a rougher Americana-style or soulful blues context - and a lot more besides. It's not cheap, but it does have a solid wood (not laminate) build and the phrase 'affordable boutique' just about sums it up.